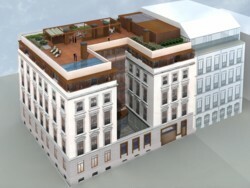 A private investment group has commissioned the architectural firm Architects EME rehabilitation of the building located in Madrid's Luchana in number 13. The objective of this project is the redevelopment of the property in a building of luxury apartments. The project will respect the building's facade, the stairs and the yard, by reconstructing only the scales living areas with a very high quality and modernity. In addition the building will have garage and shopping area as well as apartments and pent house. EME Architects presented a new draft for council housing in Getafe in Level's behalf, by which 200 houses will be built. EME shows itself, once again, as one of the most active architectural firms currently presenting a project that meets the highest sustainability and quality that can always guarantee their work. In No. 4 of Villanueva street stands the building of The Arcadia, a classical building, now being renovated by the prestigious architect Fernando Espinosa de los Monteros. This is one of the flagship examples that remain of the original residential architecture of Salamanca district. Its main attraction is the magnificent main staircase, a palatial dimensions body reminiscent of the elegant Parisian or Viennese architecture of the second half of the nineteenth century. Layetana Real Estate, in its first project in Madrid, has the promotion of The Arcadian Villanueva-Serrano, a new concept of luxury housing that represents a new lifestyle designed for senior people who are looking for unique spaces and services that make life daily work easier. Consists of 24 luxury apartments of 1 or 2 bedrooms, with an area ranging from 78 m² up to 144 m² built, with garage and storage. In the common areas, called The Circle, is providing amenities for owners such as private a la carte restaurant, private dining rooms, game rooms, gym, library, spa and massage room, laundry, maid services, car park cars, drivers, security and reception 24 hours, nursing service, etc. In addition, households will have exceptional qualities that will be equipped with special features that facilitate the daily lives of its owners, removing architectural barriers and adding emergency items such as handles in all rooms connected to the reception. - Restore the restoration areas defined as mandatory by the Special Protection Plan Heritage (whose purpose is to support real estate development with the recovery of architectural value): walls, hallway and staircase. - Development of the top floor following an architectural proposal according to the present. - Expand the building below ground to hold the general services facilities, storage rooms and garage. - Provide building the most modern facilities of comfort and security, enabling it to adapt to its new use and continue their journey living according to the regulations. - Create parking spaces below grade based on the quality parameters. - Replace the facades of Santibanes Gil Street and inside the courtyard open to this street, by a complex of old facades to the street Villanueva and Cid. In short, all these actions are aimed at rehabilitation recovery building and preserving the historical character of the place. To which must be added the challenge of keeping a perfect balance between old and new architectural design. The rehabilitation of the Palace and Tabladillo Site in Avila, the study conducted by EMA, has been awarded a Special Mention Award European Union / Europa Nostra Cultural Heritage 2006. The European Union, through the Fundación Hispania Nostra, has recognized the work carried out in the palace and site in the town Tabladillo Eye avulense Athos. By Europa Nostra Awards, the European Union underscores the importance of cultural heritage as a means of building the European identity and as a contribution to strengthening the sense of European citizenship. Fernando Espinosa de los Monteros was in Bilbao to visit some of the media, general and specialized. During the visit to the city, the Founding Partner of EME Architects FORUM participated in the program of the ETB (Basque Regional Television). During a lengthy interview, he could review with the show's space, David Barber, his 25 year career and his extensive experience in the field of rehabilitation and housing. On the other hand, Fernando met with Matxalen Acasuso, architect and editor of the Journal Detail. During a working lunch interesting and the subsequent visit to the wording, there was a broad review of architectural and recent trends in the sector. In the picture, we see the two architects visiting the city on the tram.